This post contains affiliate links, meaning, if you click through and make a purchase, I may earn a commission. This is at no additional cost to you. Rest assured, I only recommend products I love. Learn more. Have your frets lost their luster? Maybe bending doesn’t feel as buttery and effortless as you remember–back when you first bought your guitar and the frets had a mirror shine on them. Well, let’s get it back. In this tutorial I’ll show you how to put the shine back on frets that have become a little funky. 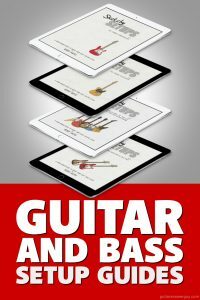 However, this method will work well for dirtier or even slightly rusty frets too–you can use the same technique, you’ll just need to add more elbow grease or perhaps repeat the procedure a few times. If you like working on your guitar (or don’t mind it), this is an easy DIY project that you don’t need to pay a pro to do. To the untrained eye, the frets on our demo guitar may look fine (my mediocre photography skills don’t help), but they’ve actually become a little hazy, and definitely aren’t as shiny and slick as they once were. This haziness is the result of buildup from moisture in the air and me not thoroughly wiping all the sweat off after I play. They’re not totally destroyed but definitely not as clean as they should be. Bending doesn’t feel glassy and effortless, the way it used to. There’s more than one way to clean and polish frets, depending on how bad they are, but here I’m going to demonstrate the easiest, fastest method I’ve found for putting a slick shine back on frets that have become a bit dirty, and just need a little love: I’ll use metal polish and fret guards to blaze through all 24 frets really quickly. If you were hoping for a demo of how to rehab really cruddy, disgusting frets using stuff like steel wool, sandpapers, etc., well, that’ll have to wait until I get my hands on a guitar with really terrible frets (which doesn’t happen very often). Music Nomad sells the all-in-one Frine Fret Polishing Kit (shown above), which contains everything I’ll use in this demo, except the separate cotton cloth I use to buff off the polish. To be honest, the separate cotton cloth isn’t 100% necessary. The microfiber suede cloth included with this kit can be used to apply and remove the polish. It’s just my personal preference to use a separate, softer towel for removing the polish. 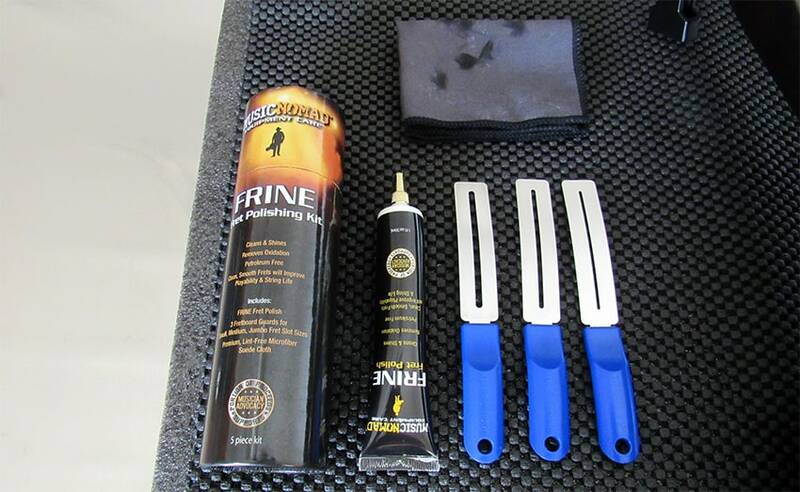 The Frine polishing kit comes with 3 fret guards, but you’ll only use one of them–depending on the size of your guitar’s fretwire. The first thing you need to do is remove all the strings from your guitar. We need complete, unobstructed access to those dirty frets. This’ll allow us to move fast; we don’t want this task to take all day. Wrap the microfiber suede cloth around your finger, as shown, and place a dot of polish on the tip. You only need a very tiny dot of polish–no bigger than a small grain of rice. 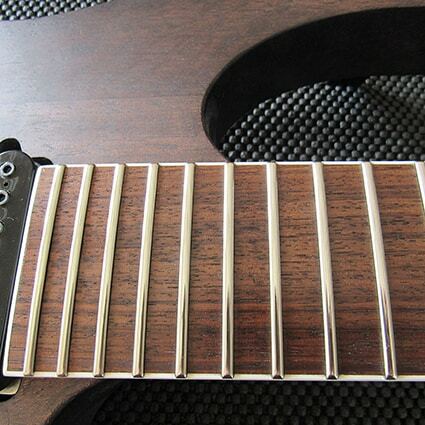 Choose the correct size fret guard–one with a slot just big enough to fit over the entire fret. I have jumbo fretwire on this guitar, so I’m using the fret guard with the largest slot. These Music Nomad fret guards are the best I’ve used, because they’re the only ones with a built-in curve and therefore lay flush against the fretboard. The handle is a big help too. Other generic fret guards exist, but these Music Nomad fret guards are the best I’ve found. Since they have a built-in curve, make sure you’ve got the curved side facing downward. You’re welcome to try taping-off if you’d like, but the fret guards are SO much faster for a simple cleaning procedure like this. 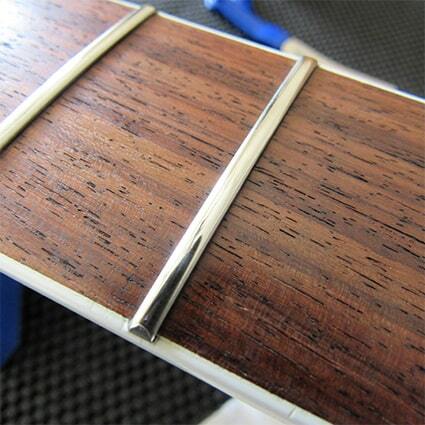 You’ll occasionally get a little polish onto the fretboard wood, despite the fretboard guards (or tape). 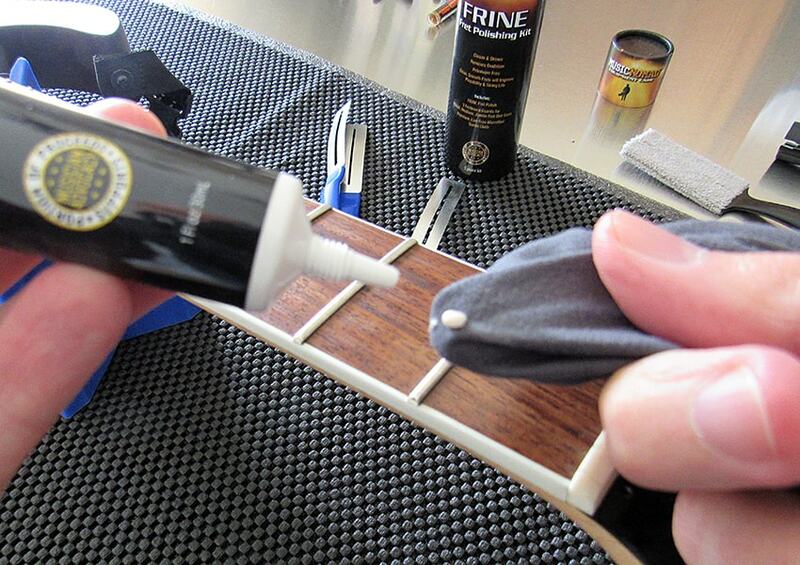 Don’t sweat it, just wipe off any polish you notice on the fretboard. 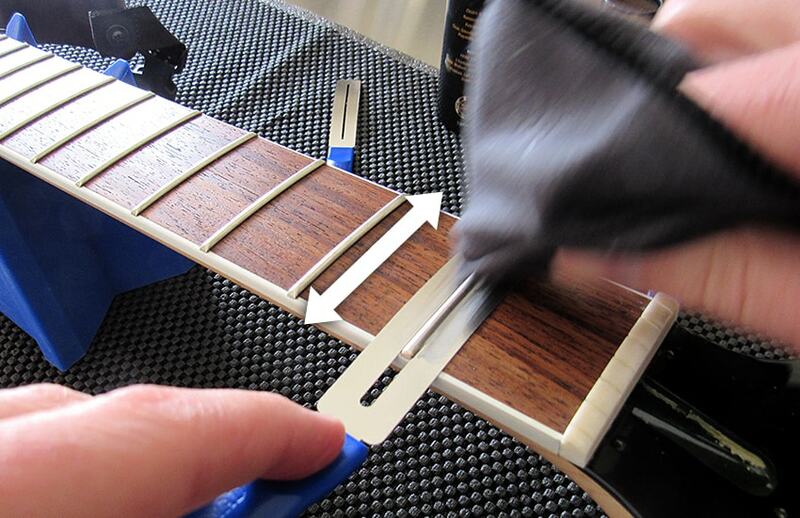 Using medium pressure, rub the polish back-and-forth briskly on the fret for about 10 seconds. 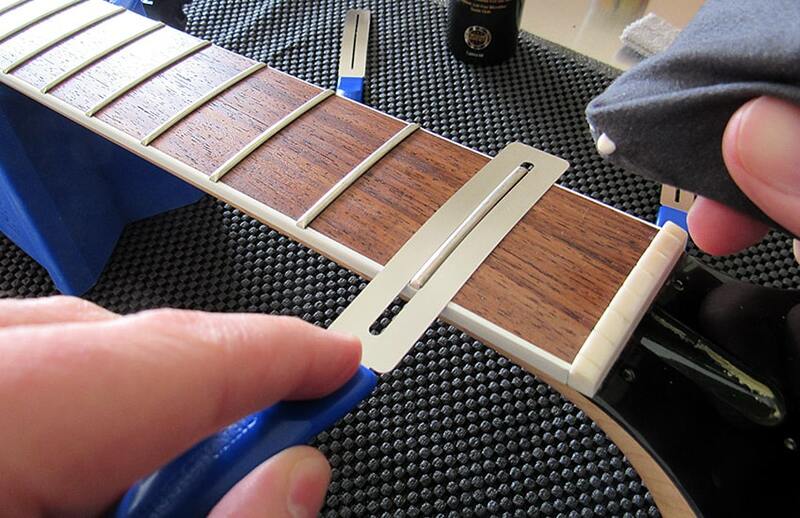 Remember to get down onto the sides of the frets too (don’t just rub the tops). We use the microfiber suede for this part because it’s not a very absorbent material, therefor more polish transfers onto the fret instead of soaking into the cloth. While you’re rubbing, you may notice the polish turning a little (or a lot) black. This is good–it means the polish is doing its job and removing any crap that’s not supposed to be there. 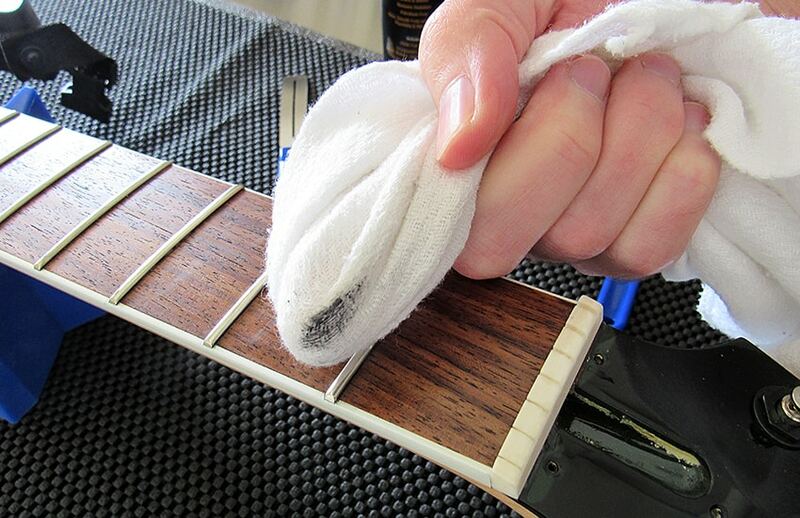 As I mentioned earlier, I like to use a separate, soft cotton cloth to remove the polish and buff the fret. Using the same medium pressure, buff back-and-forth for a few seconds to remove the polish and reveal a mirror shine. One of my all-time favorite things to use for something like this is… don’t laugh… a cotton cloth baby diaper. That’s what I’m using in the photos here. They’re ultra-soft and absorbent. Great for buffing polish off gloss guitar finishes too. 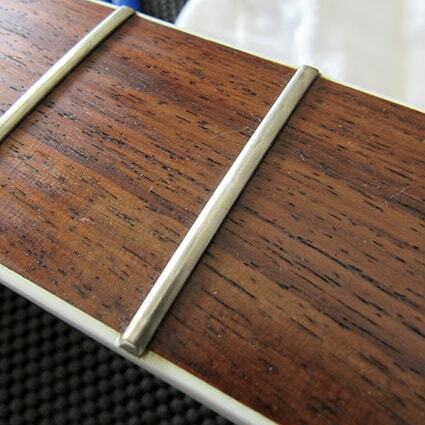 Like all metal polishes, you’ll see black stuff coming off your frets when using the Frine, and that’s a good thing. 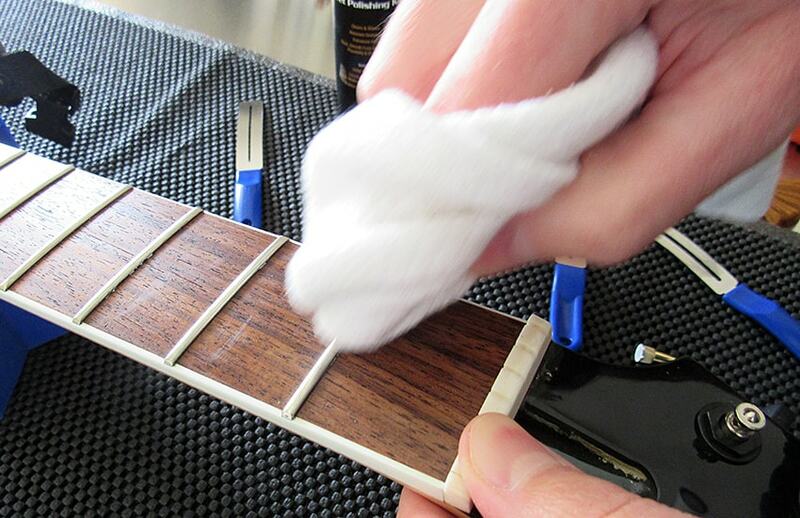 After I’ve removed all the Frine, I like to use a clean spot on the cotton cloth to give the fret one last buff before moving on. 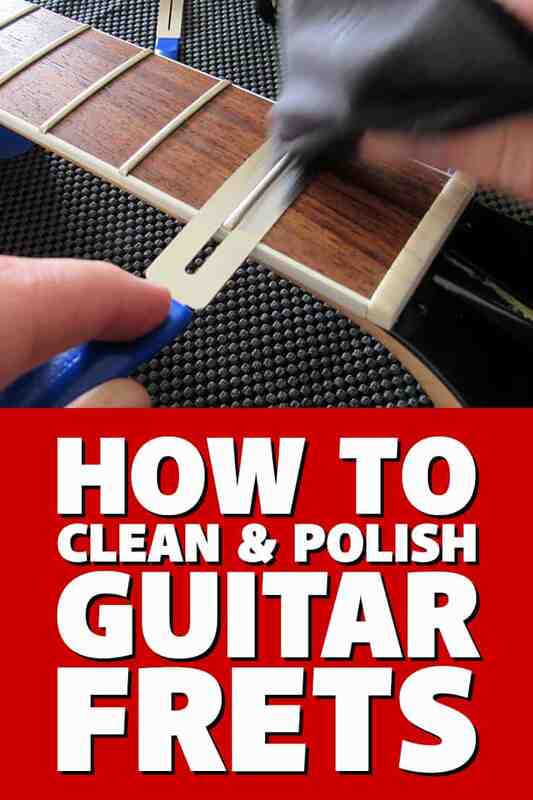 Remember, also wipe off any polish you see on the fretboard wood. You can do the same fret once or twice more if it’s really dirty or if you’re just feeling ambitious and want to see how shiny you can get the fret. Often though, just one or two passes is enough to bring a fret back to life. Repeat the procedure on all your remaining frets. 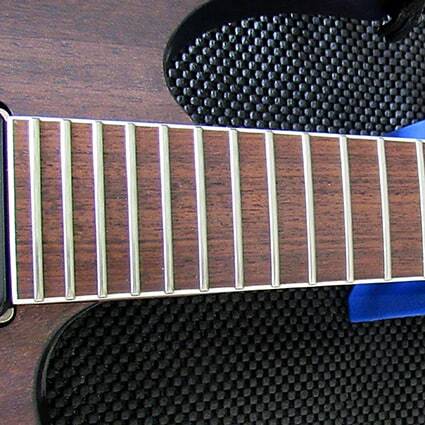 As you get to the smaller frets further up the fretboard (roughly the 20th – 24th frets) you’ll find that your fret guard is too wide to fit between the surrounding frets. Just do your best. 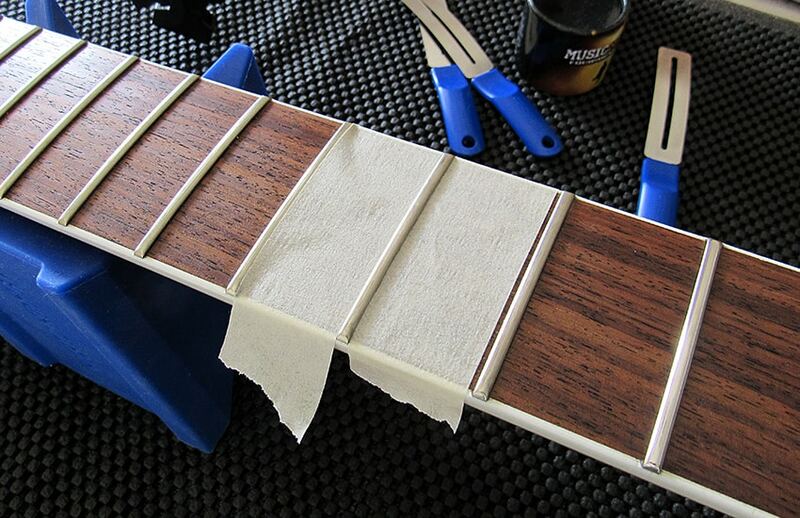 As I said before, a little fret polish on the fretboard won’t damage it, as long as you thoroughly wipe off any excess. Once you’re done with all the frets and you’ve cleaned off any polish that might’ve gotten onto the wood, install a fresh set of strings, or maybe use the opportunity (since all the strings are off) to thoroughly clean the fretboard before restringing, if it needs it. If you’re not sure how to clean your fretboard, fear not, I’ll be creating a tutorial on that very soon. In spite of my poor photography skills, I’ll do my best here to show you the frets before polishing with the Frine, and how great they look after. You’ll have to take my word for it when I say that, in person, the difference is even more striking. It’s important to point out that this method does have its limits. 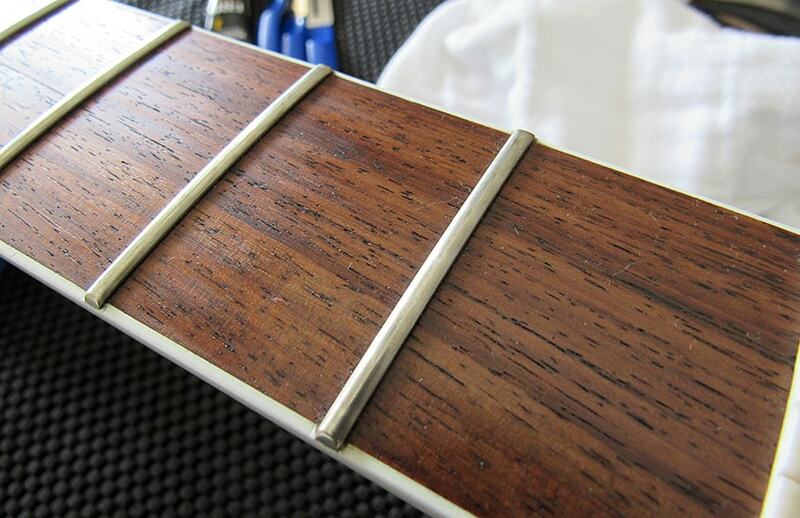 Just using a polish in this manner is great for frets that are in good physical shape, and don’t have tiny surface imperfections like scratches or pits. However, polish alone isn’t abrasive enough to remove scratches or pits, so if they’re present you’ll be limited on how shiny you can get your frets. 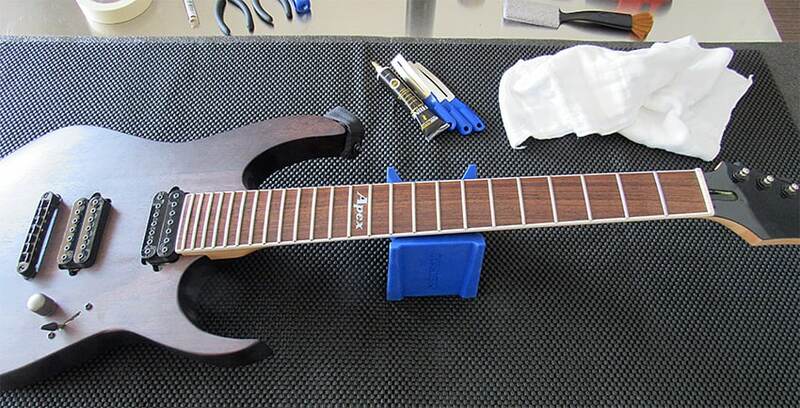 If your frets are scratched or rough, you’ll need to do some labor intensive work first… using products like Micro Mesh sanding sheets, buffing compounds, etc. At that point, you’ve moved beyond the “simple DIY” technique this article was meant to teach. For frets that are really bad and/or have some scratches and pitting, after I’ve taped off the entire fretboard I’ll begin with #0000 steel wool, followed by successively finer grades of Micro Mesh sandpapers, then finally hit it with a tiny buffing wheel (loaded with polishing compound) on my Dremel. After all that work, the frets will have an insane mirror finish. However, that whole process can take 2-3 hours, depending on how bad the frets are (and how much coffee I’ve had). It’s an all-around more time-consuming ordeal that requires more prep, materials, and cleanup. You don’t need to worry about all that right now. It’s total overkill for 90% of you out there. However, if you’re interested in learning that stuff, I’ll be teaching it in a future blog post if I ever get my hands on a guitar with really terrible frets. I generally avoid using Pledge on any part of a guitar. However, a friend of mine who is a luthier at the Paul Reed Smith factory has used it for years without issue. Indeed, I’ve heard of other reputable builders and manufacturers using Pledge on the glossy, lacquered parts of guitars as well. I wouldn’t recommend using it on the exposed fretboard wood though. You’re probably okay using it, if you must, on the back of the neck. However, I’d recommend sticking with fretboard-safe oils for the fretboard. On the other hand, if your fretboard has glossy lacquer on it as well (like many Strats), you can probably use the Pledge on it as well. You’re doing a great job keep doing what you do. 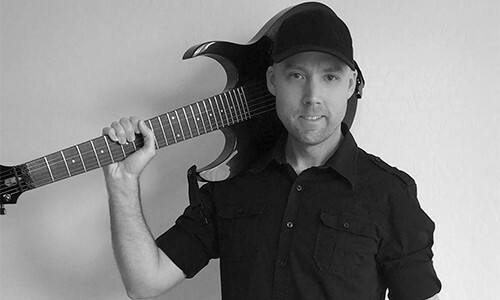 Humidity Control Solutions for Guitars Guitar Action – What’s a Good String Height?